For those of you with younger boys, you may have run across this dilemma. Your son wants a superhero room. You don’t love the idea. I have referred to these theme rooms a few times, and in my opinion, they generally end up tacky. Especially theme rooms that revolve around a cartoon. Unfortunately, oftentimes this is the case for the superhero lovers too. And that is because most of the superhero room decorations ARE tacky. The comforters & sheets are poor quality (which is why I don’t even recommend limiting a theme to sheets, they are usually dreadfully scratchy and poor fitting) and the theme just doesn’t lend itself to a tasteful room. Most of the time. I have suggested vintage prints of superheroes as a compromise and that I think works well. Pottery Barn has some, or you could frame comic books if you found pictures you liked. I am all for kids being kids, but I just think we can let them be kids AND have some class and taste too. Give them some artistic appreciation, but done in a way that would appeal to a kid and not nauseate an adult. They don’t have to have a Monet or Renoir inspired room to learn taste. I of course have no problem with superhero rooms in anyone else’s home, you can do what you are comfortable with, I just feel like kids will learn their sense of taste from us and we should do our best to keep things from getting too focused on a cartoon theme they may not like next week. For their sake, as well as ours. That is just me. A simple mural or a few accessories are no big deal, I am just talking about the all out Sponge Bob room, those just are hard to pull off in a classy way! Even for decorators. Again, it is all up to you, I don’t fault you if you decide to go that route. So today I found a super hero inspired room that I think does a great job of appealing to boys AND being tasteful, and in the interest of boys who love superheros, I will share what I found. It is no secret, it is in the Pottery Barn kids catalog, just like the Superhero prints that I shared in a previous post called “About A Boy”. 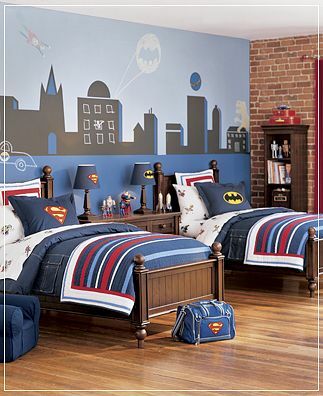 I think, as they usually do, Pottery Barn found a good way to incorporate superheroes in a tasteful way. Making it a room inspired by superheroes, but not consumed by them in a tacky way. That is the key, making your room inspired by something, not overwhelmed by a theme. Using classic original artwork style superheroes, they have designed a room with a cityscape border (available from Pottery Barn), decent looking sheets and then balanced it all out with classic quilted bedding and accessories. Notice the brick wall, that keeps the room from becoming overwhelmed by cityscape decals! It suggests a theme without getting carried away. Most of us don’t have brick walls, but if we did, that is very cool. If you are artistic and have lots of time on your hands, you could paint a brick wall! I am pleased to have a photo to show you there IS a way to do the superhero thing if you must — just learn from Pottery Barn. It is probably more “theme” than you really need, but still a fun room. A superhero inspired room can be tasteful, and I think Pottery Barn has the right idea! I don’t have boys, but the room shown is something I could live with. This is exactly what I was looking for! My 4 year-old son loves superheros, but the usual beddings are all just too much. I also wanted something that he wouldn’t grow out of in a few months. I think this could last a while for both of us. Thanks! I made my son a Superman room – take a look – didn’t come out bad and not as “tacky” as it could have been. Thanks for posting this, the PB website no longer shows the full photo & I was looking for it. I agree that this is a tasteful classic way to have a fun room! Help – PB doesn’t sell the batman cityscape any longer and I can’t find it on ebay…. does anyone know where I can get my hands on this? Thanks! Double Help! – PB, EBay, have no listings for the Batman/Superman Cityscape any longer. I cant even find a decent full color photo of what it looked like. I thought if I could not find the PB version, I could reproduce it with a local artist we have used before. Any help would be appreciated. What did you use for curtains? I printed the photo you have on your website and made a transparency from it and then used an overhead projector to trace it on the wall. It looks perfect. I used chalkboard paint from home depot and liquid chalk from pottery barn. This is nice to see. My sister has a dilemma. Her 4 year old boy and 2 year old girl will be sharing a room. The two year old doesn’t care, but the 4 year old wants a superhero room. She has very good taste and I’m sure she could make a great not-too-theme-y room for him, but how to incorporate a girl into the mix? Thank you, thank you! You took the words right out of my mouth. What I like about this room is you can easily convert it inot something else if they lose interst in the superhero theme! Thank you!